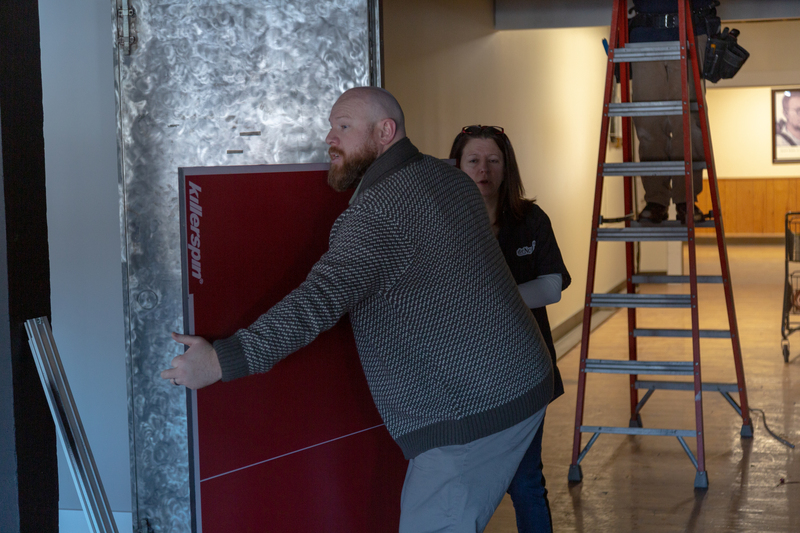 On the coldest day of the year—and in the history of Cedar Rapids—de Novo packed up our belongings and moved into our newly renovated office on the second floor of the Cherry Building, our new home, Suite 206. The good news is that when you move within the same building, you get to skip the load-everything-into-and-then-out-of-a-truck step. And because of the frigid temps, our neighbors had all closed shop, so the noise of us clomping up the stairs, dropping heavy objects on the floor and hammering away wasn't an issue. The less-than-great news was that we were forced to reckon with all of the stuff we’ve accumulated in the last twelve years. 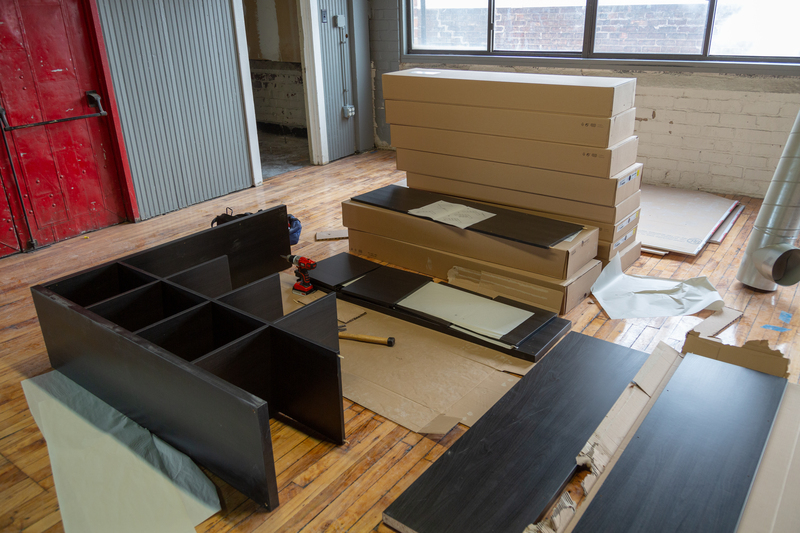 So despite the short trek to the new space, the move still took several days. 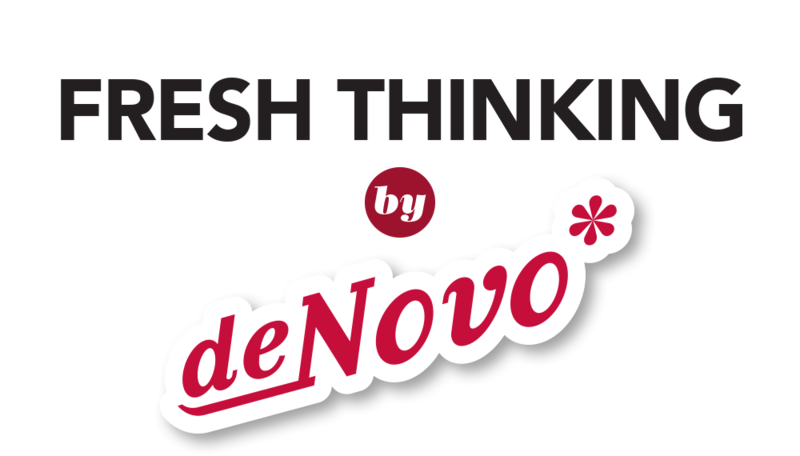 When de Novo first moved to the Cherry Building six years ago, I vividly remember saying to Jen, "We'll never outgrow this space!" Two acquisitions, 12 more employees and an expansion of capabilities sure proved me wrong. To give us room to stretch our legs and grow our in-house video capabilities, we built a production studio and conference room on the second floor (Suite 201) in 2015. The additional space certainly helped, but we were still bursting at the seams back in Suite 112! 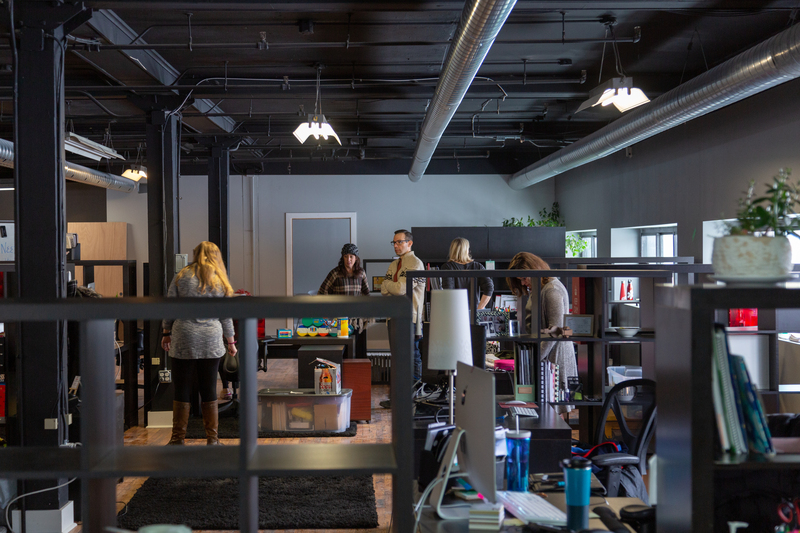 Starting early last year, we started scouting for a new space, knowing that we wanted to maintain an open concept office in the NewBo District that was big enough to house our growing Cedar Rapids team. Ecolips, the business located directly above us, had recently left the building for a bigger space of their own, opening up a large office in the Cherry Building just a few doors down from our studio. The timing, location and space were just right. From November through January, windows were cut, floors were refinished, walls were built, and our new "home" was born. 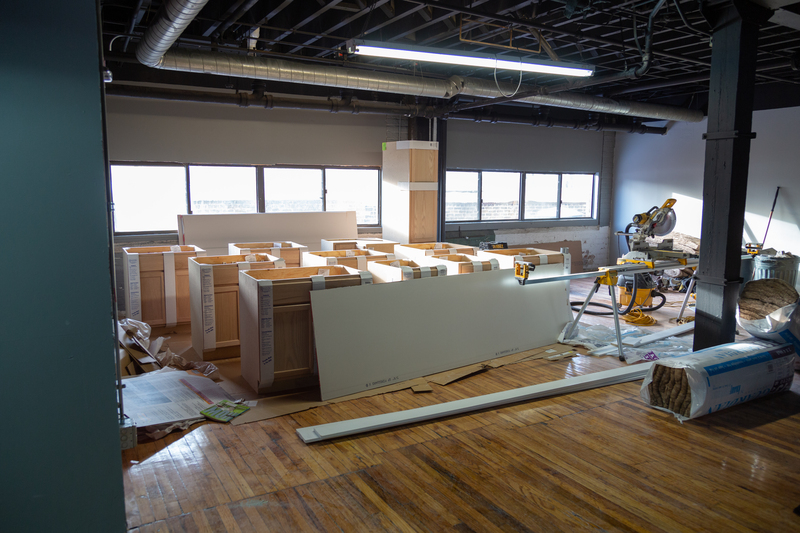 Our team of contractors is currently working on the kitchen install and hanging lights and doors, and we still have plenty of stuff to put away—but we're making progress every day. Our Collective Creative philosophy and process drove most of the design and layout in the new space. 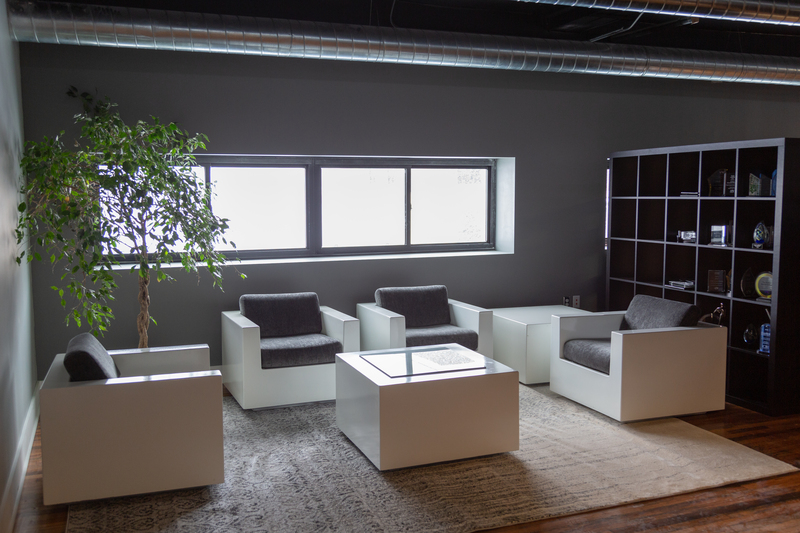 In addition to more square footage for our team, we needed to add another conference room, a reception area for clients, more storage space and room to grow. Our past offices have included shared desks, open concepts and lots of collaboration. We wanted to maintain that open feel but give team members a little more privacy than in past locations. This forced us to get creative with the layout and include tricks like strategically-placed bookshelves and staggered workspaces. While designing our new suite, we also took a look at the studio and reorganized some things there to provide a better experience for clients and create more meeting spaces and storage for our video and event equipment. Stay tuned for the big open house announcement. But first, we need to get a dishwasher and order the booze! 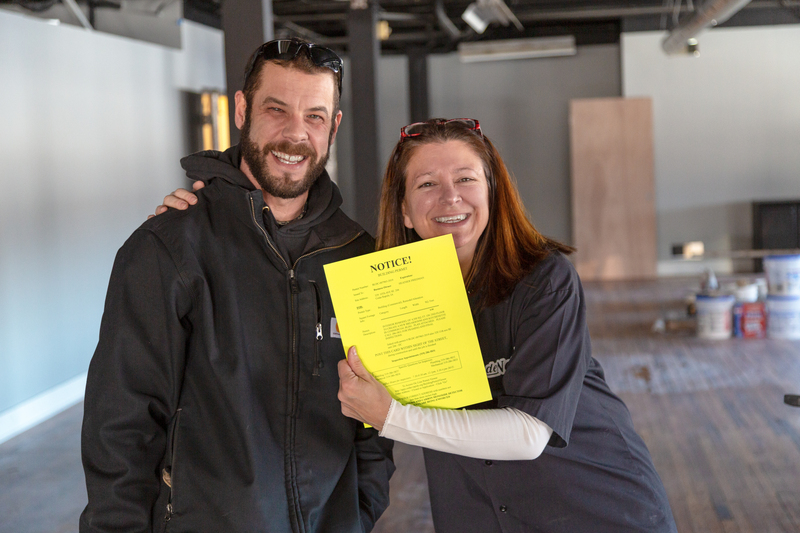 Heather and our Contractor, Ben, celebrate the start of something great. 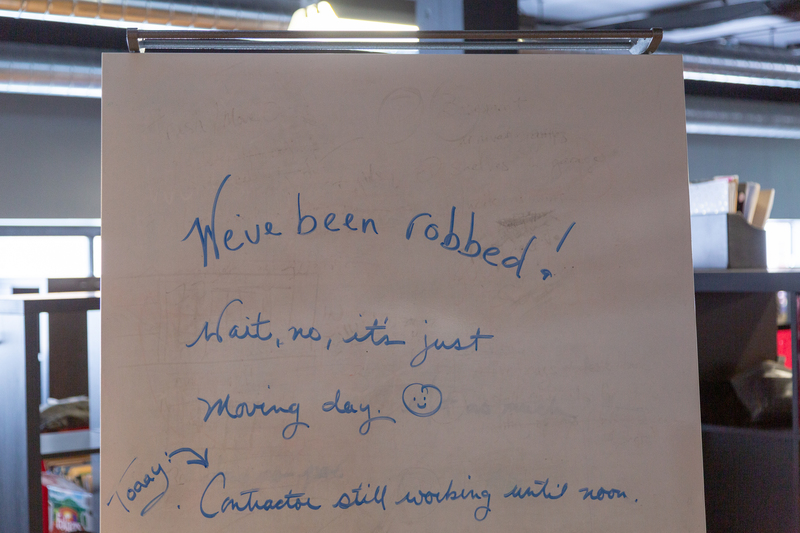 "We've been robbed! Wait, no, it's just moving day." Jen and Heather make adjustments to the layout as furniture makes its way into the new space. Matt and Heather make room for the ping pong/conference table. 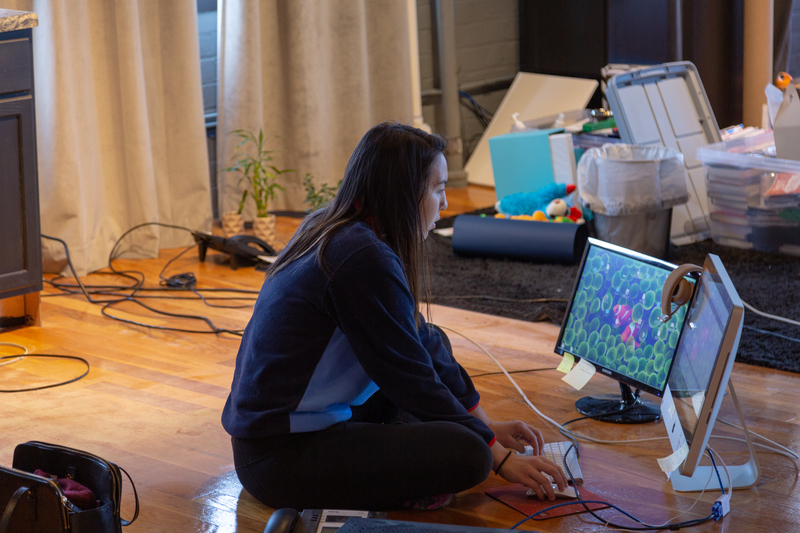 Allison and the rest of the team managed to stay responsive to clients during the transition, despite our lack of desks...or chairs. The old one gets cleared out. 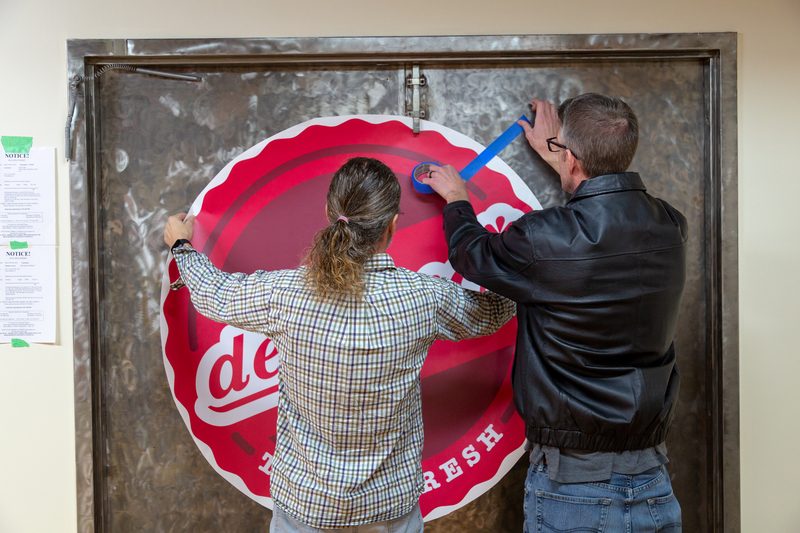 Meanwhile, Chris helps Nathan from Cedar Graphics install new door signage. Break time! 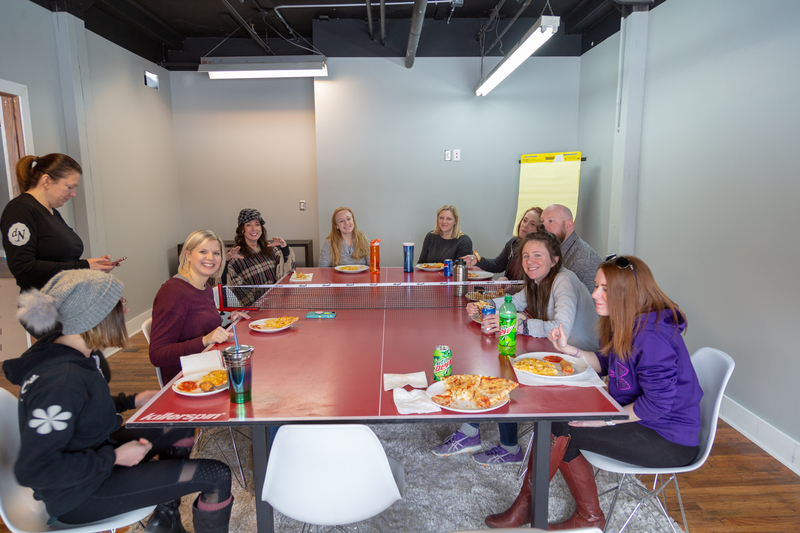 The team enjoys our first lunch in the new conference room. Shout out to our NewBo neighbors Fong's Pizza for staying open during the cold. The first completed space in the new office—our client reception area. The last piece of the puzzle—our kitchen.